NEW TOOL! How many times have we heard this? You can see the Tweet here. 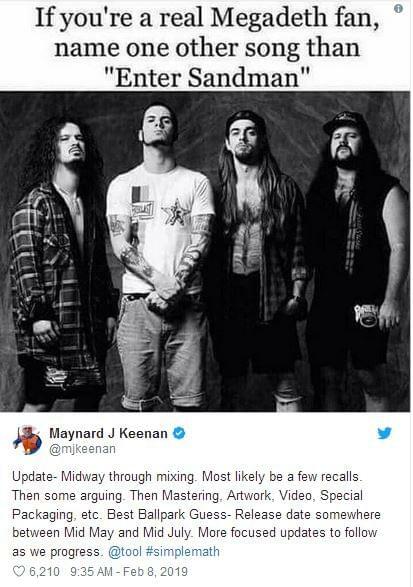 It seems Maynard wants to set the record straight after apparently bogus information came out of the Tool camp about April being the release… “Update- Midway through mixing. Most likely be a few recalls. Then some arguing. Then Mastering, Artwork, Video, Special Packaging, etc. Best Ballpark Guess- Release date somewhere between Mid May and Mid July. More focused updates to follow as we progress.”.